You may access these options at anytime by clicking "File | System Devices and Options" from the Main Menu. 2. Optionally select customized onscreen fonts and display colors for each field by clicking the applicable "FONT" button (B). 3. Optionally Setup the Scrolling Performer Rotation Display by clicking "Scrolling Rotation Setup" (C). 4. Optionally designate a Custom "Background Image" by clicking "Optional Background Image" (D). 5. Unfortunately some video devices (Video Cards) are unable to provide the correct screen parameters used to automatically position the Auxilliary (Performer) screen. 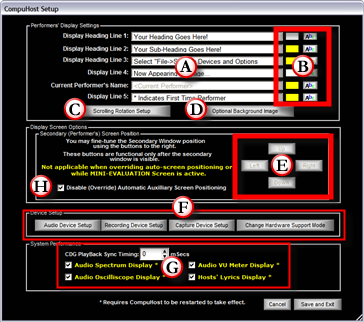 If after launching CompuHost the auxilliary screen fails to position correctly, you may "disable" Automatic Detection (H) and manually position and size the Auxilliary screen as needed. 12. Click "Save and Exit"